Few come on to RuPaul's Drag Race already as established and as well-recognized as Peppermint. Simply put, the candy-inspired drag queen is a legend—particularly in New York nightlife. Yet, it wasn't her legendary past that made Peppermint such a compelling competitor on the show's most recent ninth season. Rather, it was her decision to come onto the show as an out and proud trans woman. Prior to her stint on the Emmy Award-winning program, there had never been a queen who came onto the show already identifying as trans (season four's Carmen Carrera came out after leaving the show, while Monica Beverly Hillz came out in the middle of her season). Even if she had been eliminated on the season's first episode, her mere existence in the cast would have already solidified her as a trailblazer. But Peppermint is a fierce queen, and she lasted much longer than the first episode. In fact, after floating through the mid-ranks for the first half of her season, Peppermint made a drastic pivot in the middle—starting with her win during the Michelle Visage roast—and made it all the way to the finale, where she rounded out the very rare "final four." 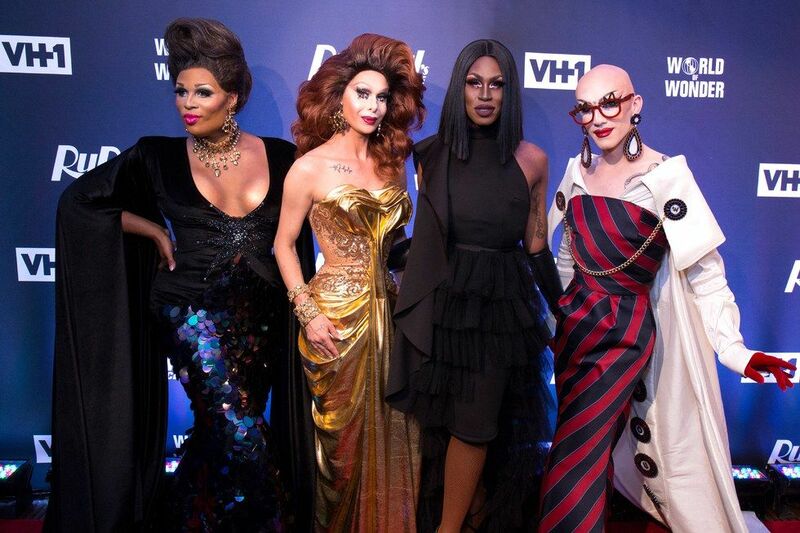 Ultimately, she would finish the competition in second place overall, beating out former frontrunners Trinity Taylor and Shea Coulee, but ultimately losing to the reigning (also New York-based) queen Sasha Velour. Now, Peppermint is enjoying her life post-show as she tours around the world to bring her particular talents (she was given the nickname of "Lip Sync Assassin" due to her ability to slay a performance) to fans across the globe. During a rare moment of downtime during the drag star's latest tour stop in Peru, Peppermint hopped on the phone with PAPER to talk about her newfound fame, being trans on television, and what we can expect from her upcoming documentary. I'm in Peru; I'm touring here. Actually, I'm touring everywhere. Peru is a fabulous stop on a very, very whirlwind tour. I was in Nashville, Tennessee, and Atlanta, Georgia, then we went to Hawaii and then Peru. There were a bunch of other places but I can't even figure out where I'm going. Other than the extensive touring, how has life been since finishing Drag Race? It's been a lot less sleep than I hoped I would get. But what the tradeoff has been is that I've been able to perform and meet a lot of people who are just as excited about drag and Drag Race as I am. It's just been insane. Here in Peru, folks were chasing our car and they met us at the airport. I'm not even sure that Drag Race even comes on TV here in Peru. In many places outside the U.S. that I've been, it doesn't come on—legally, at least. I don't know how on earth it's possible that they do it, but they want it so much that they find a way. So I want to talk about that finale. Given that you were deemed the "Lip Sync Assassin," how did you feel when you first heard that the structure of the finale was going to be heavy on the lip syncs? Well, I knew something was coming. Once we found out there was going to be a final four [instead of three] going into the finale, that was different alone. So I knew that they might throw something at us that was unexpected, but I was hoping that they would just pick a winner from the top four. But obviously things turned out differently, and I was not mad at it because I was happy and thankful for the opportunity to perform. That's kind of what I love to do, so I wasn't scared or nervous about that. The way that they were going to do it seemed a little…I don't know, it didn't allow for much preparation. We didn't find out that much earlier than the rest of the world found out, so it was nerve-wracking. We had to learn several songs, and of course you don't know what songs you're actually going to [have to] perform. So you don't really know how to plan your outfit or your performance. So we were all backstage not sure of what was going to happen. I was talking to Sasha and she was like, "Well, if this song comes on, I won't use the roses but I'll wear this wig and I'll give the roses to somebody else." Like, that's what we were backstage doing! But I think it all worked out perfectly the way that it did and I'm very happy for Sasha. You said you found out when the rest of the world did. Was that during the reunion? We found out a little beforehand. We found out, of course, when we filmed all that, which was about a week before it aired. The finale was at the end of June, so we filmed that in June, but you know most of the season is filmed much before that—like last year. So we had some time in between, but we didn't know how any of this was going to shake out. We weren't given the songs until we were getting ready to go to film that weekend, which was for the finale and the reunion. Your appearance on the show this season came as a big deal because you were the first contestant to start the competition as an out trans woman. How do you think your run on the show will influence the show moving forward? I'm just extremely happy that I had the opportunity and am glad that things played out the way that they did. This is my third time auditioning for Drag Race before I got on. Of course, I was frustrated initially that I didn't get on. Honestly, when I was auditioning [for this season], I was like this is my last time. I have so much other stuff to do, including continuing on with my transition and trying to really focus on that and take care of that. So when I got on, I was obviously extremely happy, but of course I didn't know what to expect. I knew that there had been other fabulous trans women who have been involved in the show but I hadn't quite seen an example of anyone else who had done it the way that I did it from the beginning, so I didn't know exactly how to navigate the situation. I had to try a couple of doors, and now that the season is over hopefully those doors will remain open. I'm excited to see what they do with the casting for season ten and for the future. I think I was an example of a trans woman who contributes to the art form of drag in a way that's just as fine as anyone else; clearly, [it's better than] at least eleven or twelve of those people [who I placed higher than], in terms of the competition that is. And I know there's lots of other trans women who are really fierce queens and great entertainers. So I'm hoping that the show provides the opportunity for the rest of the world to experience these great entertainers in the way they have done with the other girls that have been on the show. As you said, you were better than a lot of the other queens, which helped you to finish runner-up. Given how high you placed, would you ever consider going on All Stars to compete for the top spot? I would. Absolutely. [Competing the first time] was such a robust experience that I would have to take a moment to figure out the best time and place to do it again if I were asked, but I think it would be fun! I love the show. I'm a huge fan of the show. Of course being a fan of the show is a lot different than being on the show and doing the show, so that was a little bit of a learning [experience] for me, but I would do it again and I cannot wait to see who they pick for All Stars [season] three. So I want to talk about the documentary, Project Peppermint, you've been working on. Basically, I asked a friend of mine to film a couple of my performances and he did a couple of years ago; this was before Drag Race. He just ended up going to several shows, and talked to a few people. It was just a little collection of a couple of videos, and we were thinking, "Oh, we can cut this together to save these as home movies or something." But then I got on Drag Race and everything obviously changed, and kind of heightened and expanded and maximized. And he kept filming. He didn't go to Drag Race with me, obviously, but he had been filming through that entire time. We're still filming but we're almost done. Well, I don't even know. It's been an interesting process though. Doing drag shows is already crazy enough with the element of traveling and being on Drag Race—which is great and is a blessing, but does add a certain level of frenetic energy that most people may not have around their performance to begin with—so having a camera crew there on-the-road in an environment that we really can't control (the lighting, the sound, whether there are electrical outlets to charge the batteries, how many people can fit in the car—like, can the camera crew fit in the car as we're going to the show? ), it's a lot. But I think it's all worth it. They've been with me. This camera crew has been more in my life than even I have because they were there in moments where I wasn't even necessarily completely aware of what was going on. They stepped with me into the operating room for several of my surgeries. I don't even know what that's like! I was knocked out. So it's an extremely intimate relationship. I was a little hesitant at first to be so open. I'm a really private person—I've got social media, and I was on Drag Race, obviously, but I'm not as completely open and sharing everything that happens to me at every moment of the day, especially in comparison to a lot of the other queens that have been on the show. So I wanted the chance to kind of give this as a gift to myself and to anyone else that's interested. I think it just shines a lot on what it's like to be a drag queen and what's it like to be on Drag Race and what it's like to be a trans woman navigating her life and her transition and the health care system and today's politics and all that piece of it. All of that is an undertone, but it's happening to me and with me the whole time. As a queen who came up in New York, what would you say are the main advantages and disadvantages of being in a city that's so culturally rich? Well, my real start to drag was before I moved to New York. I had done it a couple of times and had a little bit of practice. I had gotten my feet wet and had a couple of outfits that I wore all the time. Like the same ones every week for a year or two—it was ridiculous. When I moved to New York, the first place I worked was a nightclub called The Tunnel, which was a Peter Gatien nightclub—he also owned the Limelight and a bunch of other legendary clubs, which, anyone who's seen Party Monster, knows what that's all about. So it was easy to get my start in drag there in that zone because people were just about being creative. There wasn't yet a drag queen that… The only drag queen that really made a serious living traveling the world as the most famous drag queen was obviously RuPaul. That was something different that we didn't have access to. All we could do it for was the creativity of it and for the love of drag. We weren't even really getting paid. I was getting paid fifty bucks a week! A week! That was for one show a week in the 90s, like 1997. And that [rate] stayed that way at that club until 2000 when it closed. So, I wasn't really making any money. I was doing it for the love of drag and the excitement of the nightlife scene, which New York has and definitely had in those days. Obviously things have changed—and they always will—but it does get difficult when you decide that this is going to be your career path. Or maybe when the career path chooses you, it is difficult to maintain because drag is one of those things where we do our own hair, we do our own wigs, makeup, and outfits. We're kind of renaissance women! We're our own choreographers, in many cases, our own business managers, etc. We have to throw it all together and there are not a lot of people that are usually helping us or being there with us. We're just kind of running the whole show. I remember being at Candis Cayne's show at Barracuda in New York and, you know, she was looking so fabulous. I don't remember if there was like a stage light or something that was on the stage, but the switch was next to the performer and the performer had to turn on the switch to start up the action. She went over to turn it on and got an electrical shock, and a spark came out of the wall. It's like…this is what we do as performers! But New York does have a lot to offer because it draws so many people. In New York, it's a really eclectic scene. You can get all types of drag queens. People come for fashion into New York; people come for theater, like Broadway, to New York; obviously [some] people are drawn to New York just for the nightlife! So all of those things inform the different types of queens that are here. There are fashion queens, there are musical theater queens—obviously Alexis Michelle is a Broadway girl—there are so many different types of queens, and the different flavors are kind of dictated by what drew people to New York City to begin with. That's what makes it really eclectic because there is a lot of competition. I guess it's just survival of the fittest in terms of who stays in the city and who can maintain a career in the city. I'm really happy that I can not only pay my rent in New York City and can perform solely doing drag, but can also travel the world on the type of salary I was getting—which is not that much, but it worked. I carved out a space for myself over the twenty years that I've been doing drag and I'm really thankful for that.